Medical board records show the plastic surgeon who reportedly operated on Kanye West's mother before she died had two malpractice suits filed against him that ended in payouts and was arrested twice for driving under the influence. The records say the Medical Board of California is investigating whether the license of Dr. Jan Adams should be revoked or suspended after he was arrested twice in the past four years for the alcohol-related offenses. The records show that in a 2006 case, Adams was found guilty of driving with a blood-alcohol level of .08 or greater, and that he pleaded no contest in 2003 to driving under the influence. The records also indicate that in 2001, two malpractice lawsuits against Adams ended in payouts of $217,337 and $250,000. Further details were not disclosed. Preliminary information suggested Donda West died from "complications of surgery," said Lt. Fred Corral, a county coroner spokesman. An autopsy was expected to be conducted by Wednesday, Corral said. 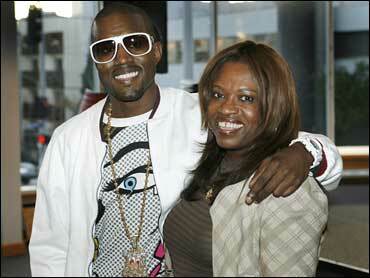 Donda West died Saturday night at age 58 at Centinela Freeman Regional Medical Center in Marina del Rey after she stopped breathing at her home, according to Deborah Ettinger, a hospital vice president. She was taken to the hospital by paramedics. "We tried to resuscitate her, but were unsuccessful," Ettinger said. West did not have surgery at the hospital, said Ettinger. Dr. Adams told celebrity Web site TMZ that he performed a tummy tuck and breast reduction on Donda West, but that she might have died from a heart attack, pulmonary embolism, or massive vomiting. He said he did nothing wrong. Adams said West consulted with him over a period of four months, often changing her mind about the surgery, according to the article posted late Monday. It was unclear when or where Adams performed the surgery. Attempts to leave a message at a listed office number in Beverly Hills were not successful. A call to a home listing in Laguna Beach was not answered. A plastic surgeon, Dr. Andre Aboolian of Beverly Hills, said Monday that West had approached him months ago about having cosmetic surgery. He said he never performed the procedure, telling her he was worried about a pre-existing condition she had. Aboolian told West that she needed to get a medical clearance before he would agree to do the surgery, said his publicist, Jo-Ann Geffen. He never heard back from her, Geffen said. "I spoke with her two weeks ago and she was supposed to see an internist for the medical clearance but she never followed through," he told "Access Hollywood. In a statement, Dr. Aboolian told CBS News: "I always insist on a medical clearance for women over 40, and in this instance it was particularly important because of a condition she had that I felt could lead to a heart attack." Adams told TMZ that Aboolian was "manipulating the truth to elevate his own importance," but didn't elaborate. Although many plastic surgery procedures have been done for years, experts say they still carry risks. "People need to realize that this is surgery," plastic surgeon Dr. Darrick Antell told The Early Show co-anchor Harry Smith. "And I think that sometimes people tend to denigrate it and think it's like getting your hair done. These are real operations with real potential complications." Antell says people interested in plastic surgery should seek a board certified plastic surgeon and an accredited facility. Also make sure the doctor has the privileges to do the procedure in a hospital. Even if he or she operates in an office, being allowed to do the procedure in a hospital shows the doctor has been peer reviewed. The Kanye West Foundation referred calls to publicist Maureen O'Connor, who said in a statement that plans for West's funeral were pending. "Kanye West, his family and friends would like to thank everyone for the outpouring of support and kind words that have come in from across the country since the death of his mother," the statement said. Reached by phone, O'Connor declined to provide more details on West's death, saying the statement was all that was being released. Patricia Green, a consultant who has worked as a publicist for West in the past, had previously told news agencies that West died after cosmetic surgery. She backed away from those comments in later interviews with the AP, saying she was not sure of the cause because she had received conflicting information. The rapper, 30, often spoke of his close relationship with his mother, who raised him alone after her husband left when Kanye was 3. He wrote a song dedicated to her called "Hey Mama."